If the Bon Me food truck had been parked curbside in Portland, Ore., or outside a bar in the Williamsburg section of Brooklyn, N.Y., the crowds would have come, rain or shine. 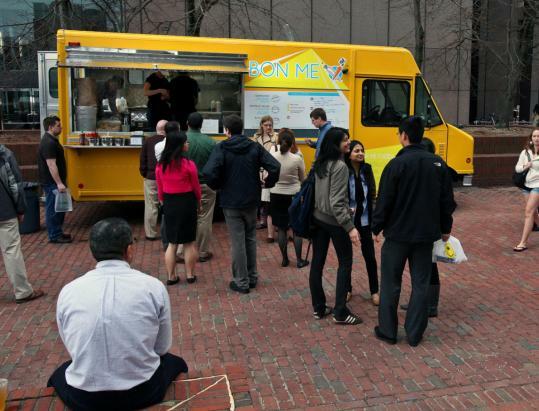 But on its inaugural day earlier this month, as Boston’s newest mobile eatery nestled into its dedicated spot beneath City Hall, it was cold, it was raining, and the crowds were not coming. From behind the window, co-owners Alison Fong, Patrick Lynch, and Asta Schuette looked downright deflated. Maybe it was the weather, maybe the fact that over the previous few days, Bon Me workers had spent more time chopping and prepping than sleeping. Perhaps Boston just isn’t a food truck sort of town. Perhaps the suit-and-tie crowd might be more comfortable with familiar food choices just steps away in Faneuil Hall, than with Vietnamese-inspired lunches. Bon Me’s banh mi sandwiches may be popular in immigrant-rich Dorchester, and they have gained cult status in New York. But downtown Boston isn’t Dorchester, and, for better or for worse, it is not Manhattan. Despite their rising popularity in such cities as Austin, Texas, and Washington, D.C., food trucks have not taken hold in Boston, thanks in part to a Byzantine system of rules and regulations. Last year, in an effort to jump start a new culture, Boston held its first-ever Food Truck Challenge. The response was promising. Thirty new and existing food trucks entered, producing 60-second promotional videos and enduring two rounds of public voting. To secure a spot among the final three, six finalists competed in a taste test attended by over 500 people. Ultimately, Bon Me’s crisp, healthy menu, designed by Fong, a Culinary Institute of America-trained chef and director of food services at Brimmer and May School in Chestnut Hill, won over the taste testers. Lynch brought the business expertise (he is a former investment banker, and Fong’s husband), and Schuette has a recent degree in food and nutrition. The public chose wisely. Bon Me’s food follows in the great, growing tradition of mobile eateries serving fresh food fast and — thanks to low overhead costs — cheaply. Judging by the food alone, the Bon Me crew had nothing to worry about. Their riff on the Vietnamese banh mi sandwich ($6), served on a chewy, long baguette with homemade mayonnaise and pate, is as satisfying as it is filling. Diners can wash it down with Vietnamese iced coffee ($2), a knockout mix of sweet condensed milk and dark, chicory-infused java. Three weeks after that dreary first day, Bon Me’s prospects look as bright as its canary yellow truck. (The color is a holdover from the vehicle’s former life as a DHL delivery van.) During one recent lunch, the line dwarfed those of its competitors, Momogoose and Clover Food Lab, two established vendors with a steady fan base. Bon Me’s menu reads like a choose-your-own culinary adventure. For $6, customers begin with the foundation of their meal — sandwich, rice bowl, or noodle salad — then choose sweet and salty BBQ pork; moist, spiced rubbed chicken; or a peppery mix of tofu and shiitakes. Last come dressings and sauces, like Vietnamese vinaigrette and fiery sriracha. Bon Me also serves homemade drinks — the best is fresh squeezed limeade with Thai basil — and rotating vegetable sides announced on Twitter. Last week’s option, chunky mashed potatoes topped with miso-roasted squash, was hearty and filling, especially considering its $3 price tag. Desserts for $1 round out the meal, but go for the coffee-infused blondie ahead of the airy chocolate chip cookie. A warning for anyone expecting Southeast Asian street food: Bon Me’s flavors are a tad muted. Pickled vegetables lack that familiar tang and the thin layer of pate gets lost beneath flavorful meats. Fong points out that the food is not meant to be authentic Vietnamese, but, she says, “Vietnamese with a local flavor.’’ This is lunch for the hungry downtown crowd, not extremes-seeking foodies. Bon Me Truck parks on the southeast corner of City Hall Plaza Mon-Fri 11:30 a.m.-3 p.m. For menu and location updates, go to www.bonmetruck.com or follow the truck on Twitter at: @bonme.